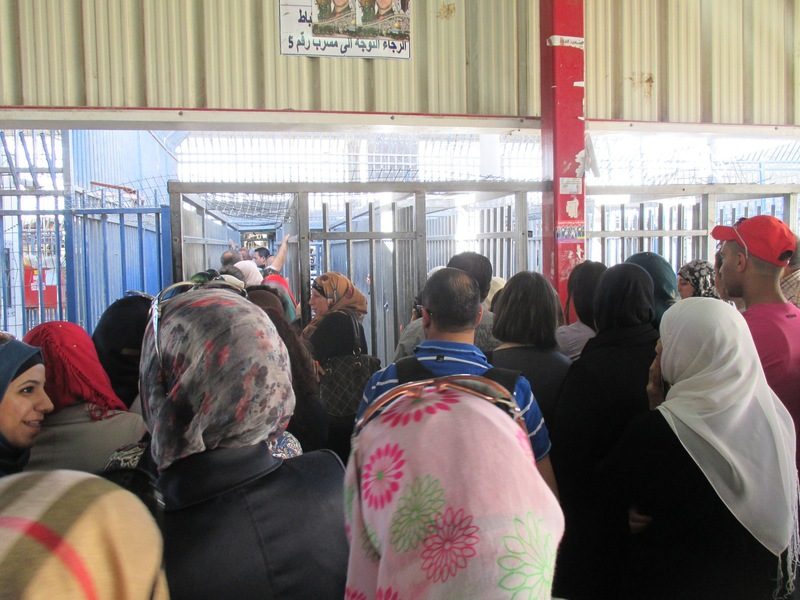 Going through the checkpoint is not just a story of queues, turnstiles, and metal detectors, but encompasses the permit system for Palestinians and the sometimes arbitrary attitudes of Israeli soldiers. It is a story of daily humiliation and dehumanization, in stark contrast to every humans right to freedom of movement. 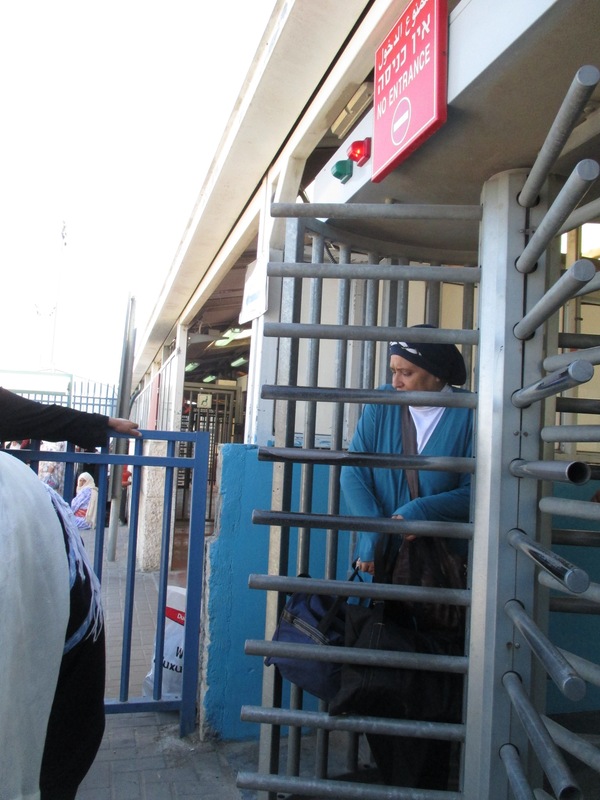 One of our regular tasks as EAs in Ar Ram is “checkpoint duty” at the nearby Qalandiya checkpoint. Qalandiya checkpoint stands between the two Palestinian cities of Ramallah and East Jerusalem. It is on the Separation Barrier, which is at this point not on the international border known as the Green Line, but some 8 km north-east, in Palestine. After waiting in queues, those crossing the checkpoint must make their way through caged aisles, big enough only for 1 person, before reaching the first set of turnstiles. Photo EAPPI/B. Currie. Twice a week we arrive about 4.15am, as the queue of workers from Ar Ram and Ramallah begins to build up, and for three hours we monitor the queues and the length of time it takes to pass through, and count the numbers of men, women and children crossing the checkpoint. At 4.15am, the checkpoint building is alive with birdsong, and fat sparrows hop backwards and forwards under the metal bars, doing very well on the crumbs left by men eating breakfast as they wait. 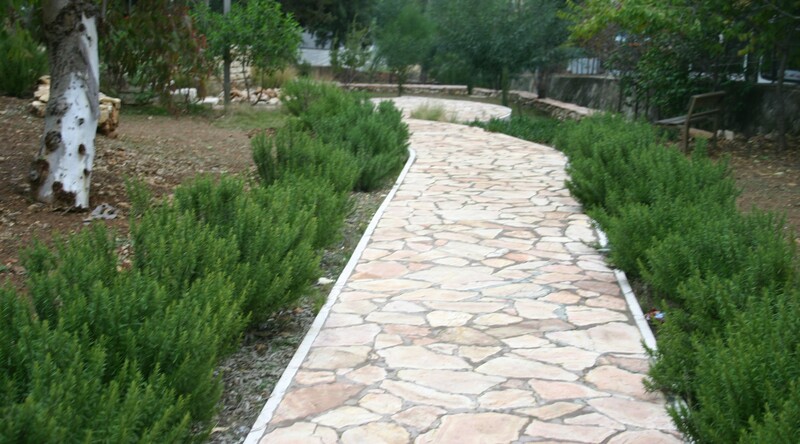 The freedom of the birds to come and go as they please is in marked contrast to that of the Palestinian people. Let me give you an idea of what is involved in crossing the checkpoint. First you wait in line in one of three metal cages that is just wide enough for one person. 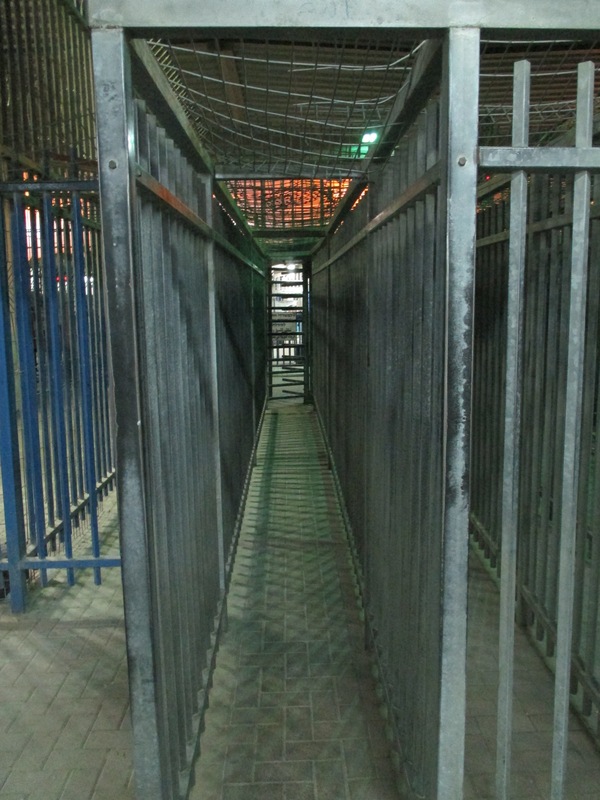 At the end of this cage is the first turnstile, which at busy times opens to allow perhaps 10 or 12 people through at a time and then closes again for several minutes. Once through the first turnstile you go to one of 5 booths where you wait again at another turnstile. This turnstile usually opens to allow 3 people through, and then closes again for three or four minutes. You are then at the checkpoint proper, which is a little like airport security. You take off your shoes and jacket and belt and pile your possessions on a conveyor belt. You walk through a body scanner and present your ID and permit for inspection by the soldier on duty. You may well have to have your handprint checked too. If all is in order you are free to pick up your possessions and pass through 3 further turnstiles before you reach the other side and the buses waiting to take you to Jerusalem. The queue at the checkpoint during busier hours of the day. Photo EAPPI/B. Currie. It sounds simple. It is anything but. The permit system which controls the freedom of Palestinians to travel around their country is a story in itself – there are 101 sorts of permits for different sorts of need, many are temporary and the process for acquiring a permit is complex, time-consuming and stressful. For now let us just say that, having reached the checkpoint, you may find that your permit has expired, or that it has been revoked, or that your handprint does not match that held on the database, or you have simply been “blacklisted” for some reason that you know nothing about. The numerous turnstiles are frustrating to navigate, especially for women with children or those with many personal belonging in tow. Photo EAPPI/B. Currie. Or, as happened recently to families embarking on a day out, you may have been told that you do not need permits for your under-5s, but when you get to the checkpoint window the soldier on duty arbitrarily decides that you do and refuses to let the children through. (The wonderful Israeli organisation Machsom Watch sorted that out very quickly for us by phoning the Commanding Officer). For many Palestinians, crossing the checkpoint is a daily piece of frustration and humiliation inflicted upon them by the occupying power, Israel. For the most part they deal with it with stoicism and patience, though understandably resorting to some shouting and remonstrations when the queues stretch out to the car park and only two or three of the booths are open.Even if your permit is fine, navigating the route through the checkpoint can be an obstacle course. There is a “humanitarian gate” for women, elderly or sick people. But it does not save you a single turnstile. And the turnstiles are a menace to small fingers and difficult to negotiate if you are carrying small children or bags and a walking stick. One of the most moving things we witness is the lines of men who, having spent perhaps half an hour or more queueing to pass the checkpoint, stop to pray on the Jerusalem side before boarding their bus. 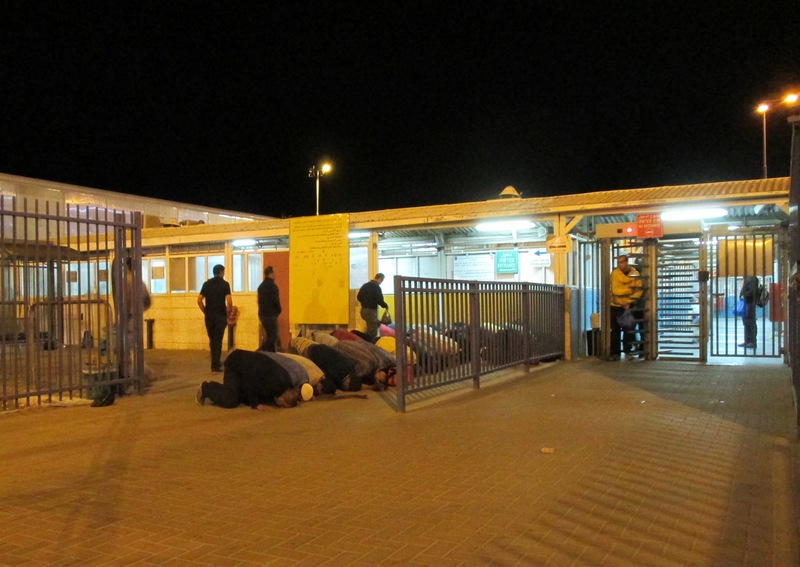 Despite the long, daily waits, many men waiting in the queue stop to pray on the Jerusalem side of the checkpoint before loading the buses to work. Photo EAPPI/ B. Currie. 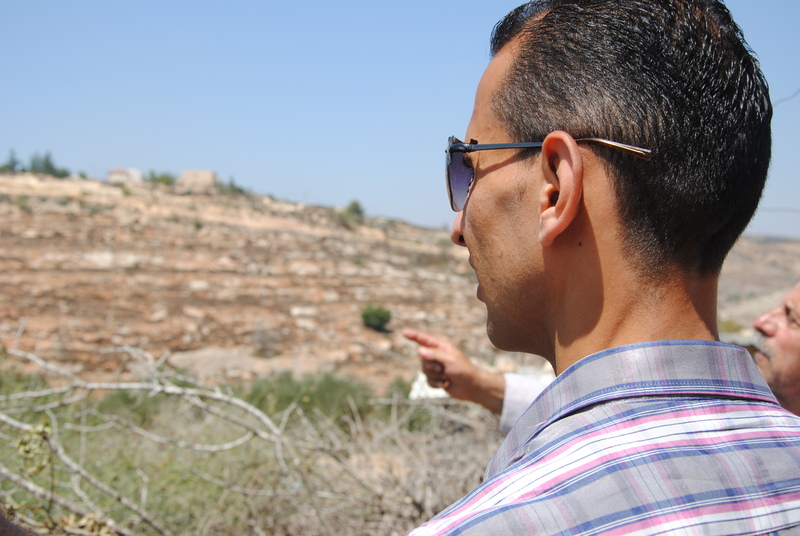 The article Early Morning at Qalandiya was originally published on the blog Through My Eyes and Ears.